If you eat it, drink it or wear it — they will come. The 55th annual Colorado Farm Show — which draws tens of thousands of visitors and hundreds of agricultural-related exhibits — kicked off its three-day stop Tuesday at Island Grove in Greeley. Exhibition halls were lined with booths from local, regional and international vendors showcasing their farm implements, produce and services. 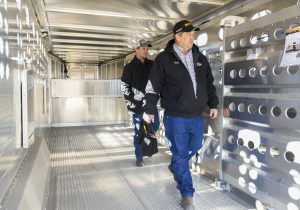 An economic impact study conducted last year states that the Colorado Farm Show generates about $2.6 million annually for Greeley and Weld County through tourism dollars spent, said former show chairman Steve Foos, who chaired the 50th and 51st anniversary shows and now serves as a volunteer. The farm show has only about an 8 percent turnover year to year for vendors, Foos said, which has resulted in a six-year waiting list. “We really need more space,” Foos said. PT Hose and Bearing in Greeley got lucky. The industrial bearings and equipment supplier on 1st Avenue opened late 2017 and secured a small space at the farm show in 2018. They’re back for their second consecutive year. The John Deere dealer 4Rivers International — which has locations from Cheyenne, Wyo., to El Paso, Texas — has been coming to the Colorado Farm Show for more than 10 years. While adult farmers made up a huge part of the opening-day attendance, little farmers-in-the-making also scampered about. Children tagged along with their guardians and were especially drawn to the John Deere tractors that towered over them. Michelle Franklin is a licensed home provider, which provides daily child care. She helped bring about a dozen of her children to the show on Tuesday; many of them took photos in and around the tractors and plows.